We’re almost to the end of our series on the Most Unwanted Garden Pests. 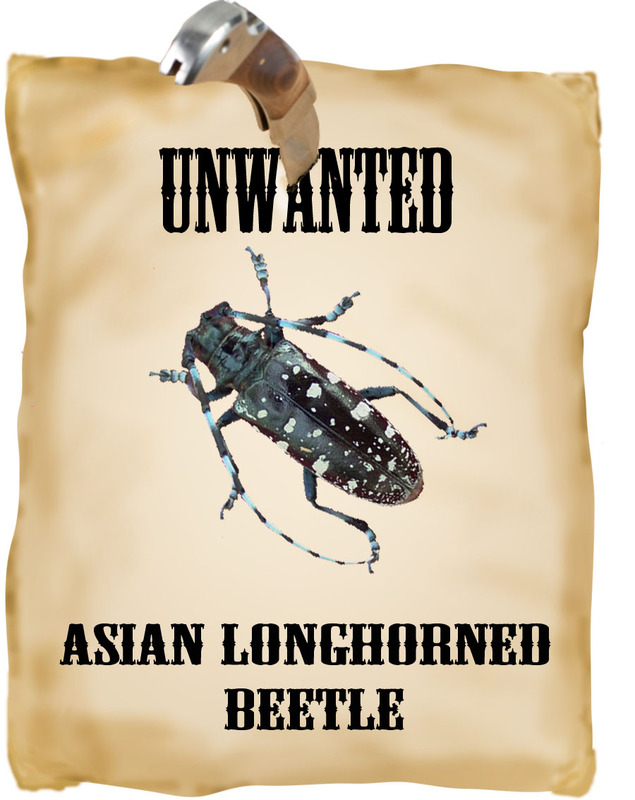 This is villain #2: The Asian Longhorned Beetle (ALB). The ALB (Anoplophora glabripennis) doesn’t live in our area (Westchester, Bergen and Fairfield counties) – yet. And hopefully, it won’t. Intensive eradication efforts are ongoing in New York City, Long Island, Massachusetts, Union and Middlesex counties in New Jersey and Ohio, the areas where ALB is currently residing. The USDA is taking an aggressive approach to this mission – any tree infested by ALB is cut down and burned. Why is the ALB so despised? Because of the deadly outcome of an ALB infestation and the extensiveness of their diet. In our area, we’ve had several species of trees virtually eradicated by insects or disease over the last century: the American Chestnut by chestnut blight, the American Elm from Dutch elm disease, and – currently – several species of ash trees from the Emerald Ash Borer. But the Asian Longhorned Beetle has the potential to decimate several widely growing tree genera in our area, including maple, birch and sycamore. In addition to the loss of these beautiful trees, the economic impact on our hardwood forests would be immense. The story of the ALB’s infiltration into the U.S. sounds like a spy movie. Someone notices a suspicious looking insect. They call a government agency. The insect is identified as a stowaway assassin from China. Soon after, the Feds swoop in and destroy the insects along with any possible hiding place. They search the neighborhood looking for more insects and any possible shelters – and in a slash and burn frenzy, cut down any trees that could harbor these terrorists. Yet this dramatic response seems to be yielding results. The ALB appears to have been eliminated in the Chicago area, and it looks like New York and New Jersey may soon follow. Massachusetts is still battling hard and finding new ALB hideouts. The USDA’s Animal and Plant Health Inspection Service (APHIS) actually acts like Homeland Security for invasive pests. They have intercepted ALB in warehouses in California, Florida, Illinois, Indiana, Massachusetts, Michigan, North Carolina, New Jersey, New York, Ohio, Pennsylvania, South Carolina, Texas, Washington and Wisconsin. And their Canadian counterparts have intercepted the ALB in several provinces there. One thing that works against the ALB is its size and striking markings. The beetles are over an inch long and colored like a Mardi Gras mask. 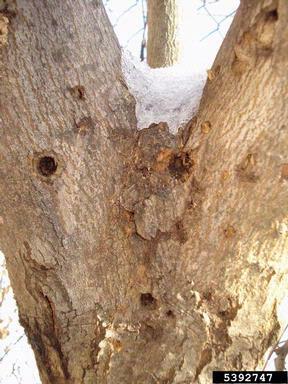 In several cases, an ALB was identified when someone saw it and said, “What IS that thing?” When a tree is infested with ALB, the exit holes can make it look like it’s been strafed with a machine gun.